...in this line of work, the past and the future are happening at once. 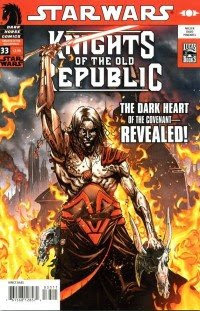 So I have here some thoughts about the current release, Knights of the Old Republic #34 (though I'm fairly careful, as always, consider a Spoiler Warning attached — read the comics first). I really do plan to have those notes up on the Campaign Guide soon... but they're doing a comedic musical number on Saturday Night Live, and my head hurts too much. Maybe another day. Good to see that Richard Garriott has landed safely from space. I cut my computer-game teeth on Ultima II (and then the others), the series Garriott created under the name Lord British — Lord British also was a character in the games, himself. Many was the time I trudged back to Lord British to level up. 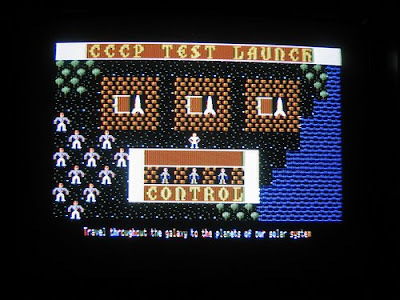 My favorite of all the games remains the time- and space-traveling Ultima II, though — in which, among other things, your character has to fly a Russian rocket to the planets and try to land safely — something next to impossible on the mod that was rereleased a few years ago, simply because the processor made the animation move too fast. And there's stuff from yours truly hither, thither, and yon today. In addition to the new Sword & Sarcasm, there's the September edition of my Newsarama column on comics history. Enjoy! Well, all kinds of cards are being turned over in this corner of the Star Wars timeline this week! First, of course, there's news about Star Wars: The Old Republic, the online RPG. You can read more background on the site itself, but a factor of note to comics readers is when it says it's set — a good while after the events of the earlier video games (and of the current comics). I encourage everyone to follow the link and learn more about it! 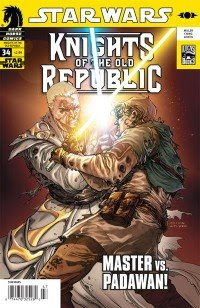 And back to those comics — and to Star Wars: Knights of the Old Republic #34, which goes on sale Wednesday. I've had this in hand for a few days now, and I feel it might be advisable to suggest keeping the Depends-brand undergarments handy. Because we provide answers to a wide variety of questions, some that have been going since the beginning of the series. Twists, turns — and all presented in a spectacular visual production from Messrs. Brian Ching, Michael Atiyeh, and Michael Heisler. (Atiyeh, I would add, really hits a grand slam with the colors in this issue — Haazen's mysterious powers giving him the chance to create some original looks for powers and abilities.) "Vindication" rages on! I feel very strongly about this issue, and I hope you enjoy it. I'll be here again soon with thoughts on the issue — hopefully, giving readers a chance to towel off! If you haven't checked it out in a while, the Sword & Sarcasm webcomic Chuck Fiala and I do is getting crazier by the episode. Good Herbert is in danger of being nibbled to death by ducks — literally — and the obnoxious Duke Benedict is dealing with a sudden transformation himself. Not counting the time when the whole site was offline, we've posted the strip regularly for more than six months. Check it out — new strips Mondays and Thursdays! And there are a couple of signed sets on eBay at the moment — a big complete KOTOR set, but also a rarely-seen batch with all my Iron Man and Crimson Dynamo issues. May be worth a look. Well, I try to keep everyone apprised here of what stuff I have coming out — but when you've got stuff in print in various places, these things are not always easy to keep track of. I used to edit Scrye magazine eons ago — and there I also produced two volumes of the Scrye Collectible Card Game Checklist and Price Guide and co-edited a Pokemon book. 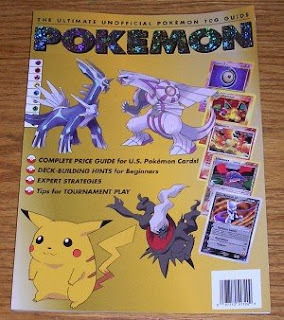 Some of that material is evidently still useful, as there's a Ultimate Unofficial Pokemon TCG Guide that's just been released — published by F+W Publications and distributed through Excell Marketing to various mass-market locations. Put together by Scrye Editor Joyce Greenholdt, it extends the Pokemon sections we put together for the first two CCG Checklist books to the present day. Sort of like getting in a time machine looking at the sections I did — but it's good to see some of this is still helping someone. A nice package, and worth checking out if you're a card gamer. Momentary observation: While I am always pleased to hear Three Dog Night's "Shambala", it does seem odd that it's currently the background music on both a beer commercial and a blood glucose meter commercial in heavy rotation. Someone needs to manage these rights libraries better! If you're seeing this post on the Faraway Press site, just click on the blog entry title above if you want to comment. Blogger is not sending a "comment" button to posts the main site, but that's where they are. Living in Wisconsin, a state much coveted by politicos this season, my and my neighbors' telephones have been ringing off the hook with pollster calls for a good long while. (Our district's congressman, Steve Kagen, actually rang up one of my friends the day of the second bailout vote to chat for ten minutes on how he should vote.) There is also the biannual yard sign battle going on, part of the "ground game" you hear about on sites like Politico and FiveThirtyEight. Since it's miles to anywhere around here, counting yard signs as you go is just one more informal pulse-of-the-electorate method. An idle pastime, to be sure, but it's often interesting. No idea if he's keeping track, but given what's been going on around here, I expect it will be a few short days before Gallup, Rasmussen, Zogby, and the like have people posted in the woods, tabulating horn honks and obscene gestures. Unless they're there already! Personally, I am pleased that 'KRP is back on "the new WGN" — even the current, original-music-ripped-out version. (Something has to take up the slack from TVLand, which continues to amble about in search of something other than its original programming mission.) Even with some jokes lost under the new dubbing, it remains superlative, a classic office comedy and a classic comedy all on its own. Anyway, one of the few intact music pieces is that closing theme, which, as I recall Hugh Wilson saying on the DVD commentary, is probably completely meaningless. I admire the poster's attempt at a translation, though his guess may be as good as any. On the other hand, as readers of one of my first published comics, Faraway Looks know, I have absorbed an uncommonly large amount of television in my day, wittingly or not. It is one of the reasons I've instituted a personal YouTube rule of no more than three searches at once — else, I'd be digging around all day in what is really an uncannily deep pile of footage. Today's failed "Stump YouTube" moment was a search for a game show I only ever saw a couple of times — "Split Second," hosted by Tom Kennedy. I recalled only that there were a bunch of cars on stage as prizes — and that it was incredibly fast paced. Not only did the Internet provide, but the first thing it pulled up was the final episode from June 27, 1975 — in which the first contestant, on the left, is Judd Rose — then a student, later to become an ABC correspondent for PrimeTime Live until his death in 2000. Where do they get this stuff? Or they should be — even the nonfiction pages. Whew! And it only took the better part of a month, but FarawayPress.com 4.0 is finally about done. The only things that need to be added are the pages for the non-fiction books, and there may be a few odds and ends still missing. But the production notes for everything should now be there. And, no, I regret that does not include notes yet for the RPG supplement or KOTOR #33. I haven't written them yet, thanks to all the time getting things back online. To the archivists out there — folks, I hope this is the last doggone time for this. Unlike the previous two efforts, I'm no longer on a database, so no more arcane URL names. In the brushes with candidates department... tomorrow's vice-presidential debate brought to mind a lot of the different folks I got to interview when I was a student journalist. As a reporter — then editor — for the University of Tennessee Daily Beacon, I interviewed a pretty diverse list of people, from soap opera actor Michael Swan to comics creator Mike Grell, who I would later follow on Iron Man. There were also a number of politicians: Lamar Alexander, sometime presidential candidate and currently the senator from Tennessee, was a former governor and president of the university system while I was there — naturally, that resulted in several interviews. I didn't interview George H.W. Bush when he came to town, but I took a position as a student aide during the presidential visit in order to get the chance to photograph his arrival at the airport for the paper. 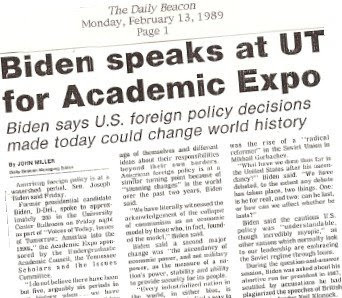 Then there was Senator Joe Biden, who, when he came to Knoxville in early 1989, had had a hell of a year. In 1988, he had run for the Democratic nomination — only to hit the shoals after failing to cite quotations from Neil Kinnock. Later in the year, he suffered an embolism. Anyway, after he recovered, the university brought him in for some kind of lecture series, and there was a slot set aside for interviews before the lecture — for whatever reason, the two local papers (of which only one exists now) didn't take part, so I wound up getting the full half-hour. It was a good thing I'd done some homework beforehand, as I actually had questions enough to get a couple of days' worth of articles out of it on topics ranging from Eastern Europe to the balanced budget amendment. I can't speak to anyone's political preference — I'm strictly non-partisan here — but I can say that he was very decent to a kid reporter scared out of his wits. A lot of politicians came through without paying much mind to the student press — OK, some of them completely ignored us. 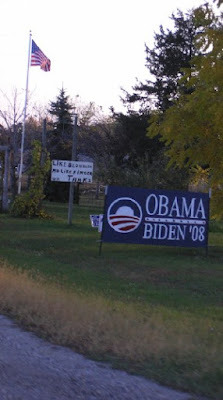 And in this case, he wasn't our state's senator and he wasn't running for anything. But he was generous with his time, and I have a good memory about that experience. In particular, this was the time when I was beginning to think about international relations for grad school (which is eventually where I went), so getting to talk to the #2 guy (at the time) on the Foreign Relations committee probably helped point me in that direction.